It’s safe to say that ingesting heavy metals or chemical coatings is a bad idea. So why continue to cook with pots and pans that pose these risks? Titanium is a great idea for cookware because it’s strong, durable, easy to clean, and completely non-toxic to humans. 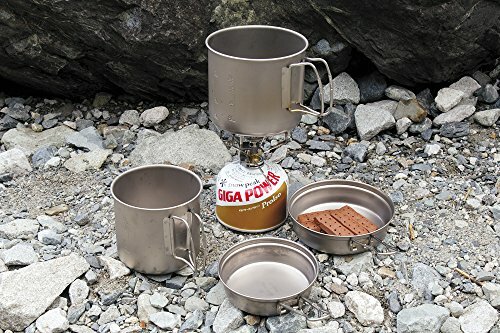 It’s also a popular choice for backpacking fans because it’s extremely lightweight, which everyday chefs could benefit from too unlike even the best stainless steel cookware. If you are wise in your choice, you could use titanium cookware problem-free for years to come. Here’s what you need to know about the best titanium cookware, including some great options for different needs and budgets. 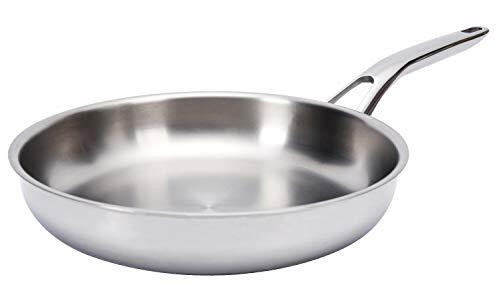 Knowing some of the properties of titanium will help you choose titanium pots and pans. Titanium is very light, and yet it’s still almost as strong as steel. It has the most efficient strength-to-weight ratio of all the common metals. Titanium is naturally non-stick, as its surface oxidizes and creates a slippery and non-porous protective film around the metal. Substances used. What is the pan made out of? Titanium is almost always combined with another substance, typically ceramic or aluminum, to aide in better heat conduction. Consider health risks when reviewing the underlying substances. Coatings. Even though titanium is naturally nonstick, some companies choose to add a ceramic or nonstick layer. This can be tricky, as some pots and pans will have a tiny amount of titanium in their product and claim all the benefits without having enough of the metal present to make a difference. Weight. The amount and number of metals present will make a big difference in the weight of the pots and pans. Titanium and aluminum mixes will be the lightest. Are aluminum pans safe? Cleaning. True titanium doesn’t require heavy scrubbing. You should be able to rinse and wipe dry. Some titanium dishes might be dishwasher safe. Warranty. If it’s truly made from titanium, it can potentially last a lifetime. Good titanium cookware should have a long manufacturer’s warranty. They claim that the coating is pure titanium sourced from England. The non-riveted surface and the non-stick coating makes them easy to clean. The added aluminum helps these pans to heat quickly and evenly. The thickness of these pans is a great feature for durability, and yet the guarantee is for only 2 years. If it were pure titanium, it should have a longer lifespan and warranty than that. Also, the rubber handles mean that you can’t put anything in the oven. This is a good set for the price. The 10 pieces are well-chosen and can cook anything. The thick aluminum cooks well, and the titanium coating does its job. A good choice for health-conscious cooks and those looking for solid, nonstick pans. T-Fal is a well-known kitchen brand. Their products have a limited lifetime warranty. This affordable set can get you the benefits of healthy, non-stick titanium and the durability and smooth heat transfer of aluminum. Plus, it includes almost any size pot or pans you could need. Includes: 8” and 10.25” fry pans, 11.5” inch covered fry pan, a 10.25” square griddle, 1-quart, 2-quart and 3-quart covered saucepans, 3.5-quart deep saute pan, 5-quart covered Dutch oven, 3-quart steamer insert with handles, and a small egg cooker (“One Egg Wonder”). 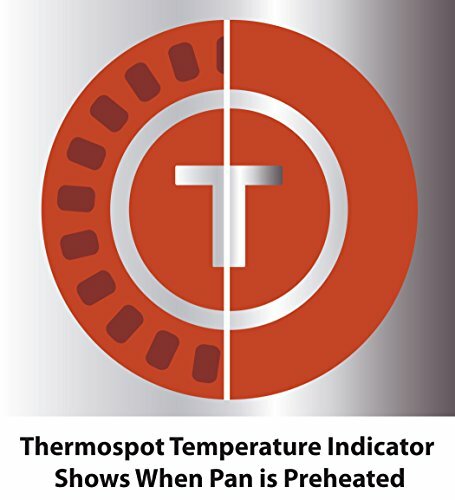 T-Fal asks that you only use at medium-to-low temperatures and that you don’t use metal utensils. This tells me that the coating is not pure titanium. 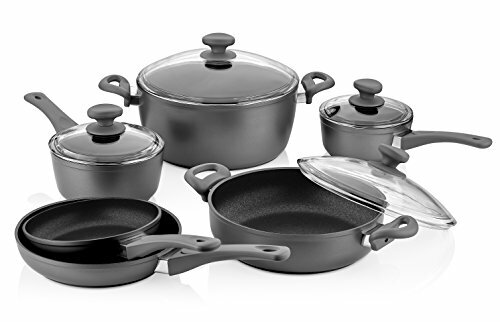 This complete set may be a good choice for a new, novice cook who just wants to cook on the stove top (only oven safe to 400 degrees) and wants the non-stick aspect of titanium. However, it’s not pure titanium, so those who are seeking titanium health benefits may be disappointed. This set is geared towards backpackers who are seeking a lightweight and small option for trekking with. The whole set is only 13 oz. in weight. This set is as strong as steel without the weight. The metal cooks evenly heats fast and cools quickly. Perhaps the biggest perk for backpackers is that you can store a portable stove and fuel canister inside to save space. Includes: 47 oz. and 30 oz. titanium pots, 5 in and 5.75 in titanium fry pans that double as lids and a nylon mesh storage sack. Just a couple of issues with this set. It isn’t totally non-stick, so you will have to use a bit of oil. This is because of the high heat source (i.e., flame) that is used, combined with the fact that these are ridiculously thin. Also, these are very small pans designed for cooking for one or two people at a time. Great for backpacking since it’s light, healthy, and won’t rust or corrode. It isn’t cheap for what you get, but the titanium could last you a lifetime if you take care of it. This set is a less-expensive titanium option. It works well as far as the non-stick surface goes. The ergonomic handle is also nice to have. The vented lids prevent boiling over, which is handy for an inexperienced chef. There are more cons than pros with this set. The handles come loose easily. You can’t put these in the dishwasher, and if you do, you will mess up the non-stick coating. Also, they can’t be used in the oven, or the handle will melt. This makes for a fussy cookware set. The surface is essentially non-stick with a little titanium thrown in for good measure. Finally, the set includes utensils, which just seem like a silly afterthought to make the set seem larger. 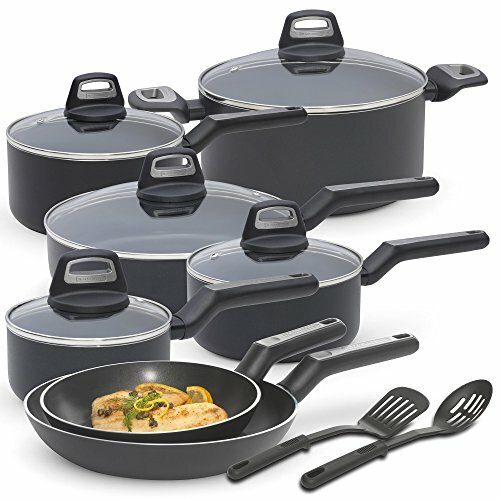 I would recommend this set to a brand new cook, aka someone who doesn’t cook anything difficult and has never used a high-quality set. This is a budget set and is not made for expert chefs or health-conscious cooks. This is an “as-seen-on-TV” product that promises to deliver nonstick greatness. The TIcerama ceramic and titanium coating makes for lightweight and nonstick pans that cook things like eggs well. 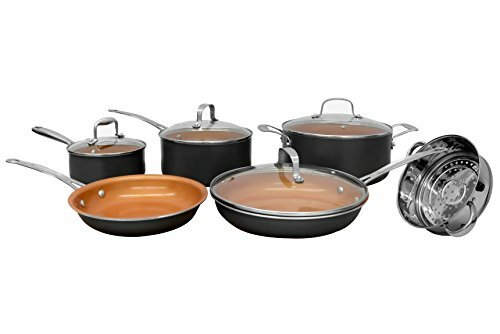 These are some of the most stylish titanium cookware as well, with an attractive design available in many colors and for a lower price than other sets. It’s also super convenient that they are dishwasher, oven, and even microwave safe! For example, you could boil potatoes, drain them, mash them, and heat them in the microwave without ever changing pots. Includes: 1.5-quart and 2.5-quart covered saucepans, 5-quart covered pot with a steamer insert, 8.5” fry pan, and 10.5” covered fry pan. See our Gotham Steel reviews for more purchasing considerations. However, the quality may be short-lived with this set. There’s a 90-day money back guarantee, but beyond that, there’s no real warranty. The ceramic coating can flake off easily when you use high heat (not recommended) or dish-washing it often. Because of the shorter lifespan, these pans would be best for someone who doesn’t cook often and doesn’t cook with high heat. The small sizes are more ideal for a couple or singleton versus a large family. 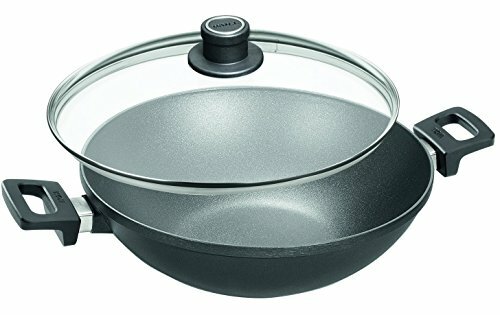 This is a high-quality titanium pan that doesn’t rely on non-stick chemicals. Just pure titanium coating. It never corrodes and never rusts. This makes it a seriously healthy option. It also cooks evenly because of the combination of metals. The limited lifetime warranty backs up this fantastic skillet. It is a little harder to clean. You could put it in the dishwasher, but it will last longer if you don’t. The natural metal oxidation can lead to some discoloration, which is normal but looks strange. Last, this 3 lb pan is very heavy compared to plain aluminum fry pans. This isn’t for novice cooks. The heating efficiency means that this is a pan for serious cooks only. When used properly by an experienced chef, this pan can last long time and keep cooking great meals consistently. The size of this skillet makes it convenient for cooking almost anything. It heats well and cooks evenly. The fact that it can be placed in the oven means that it can work as a skillet and a casserole dish in one, saving you dishes and money. The detachable handle makes for easier storage as well. The handle itself isn’t very comfortable. Which is a shame, since this skillet weighs 7 pounds and it would be nice to have a better way to hold it. The amount of titanium in the pan should be enough to stay non-stick throughout its lifetime, but it’s not. Even with the limited lifetime warranty and proper care, it will begin to stick. If you just want a backup skillet or don’t cook often, you’d be fine getting this. But if you need an everyday kitchen workhorse, and want the health benefits of titanium, this skillet will disappoint. This is a large piece of titanium cookware that’s supposed to be a wok. I would say it’s more of a dutch oven, what with the side handles and cover. It’s easy to wipe clean with a sponge, and doesn’t require a lot of oil to cook things. It’s also very high-quality and solid construction. The short handles make it hard to use as a traditional wok. You can purchase a long handle from the company, but at this price, you’d think it would have them already. The fact that it still has non-stick chemicals (PTFE) is a little disconcerting from the health standpoint. This wok isn’t ideal for traditional Chinese cooking and stir-fry’s due to the short handle. If you simply need a big and deep skillet that has great non-stick ability, then this is a good choice. This company makes a lot of backpacking gear, and that’s what inspired this large pot. It weighs only a couple of pounds, which is incredibly light considering the size. The compact fold of the handles makes it easy to store and transport as it comes with a convenient travel bag. It can be used on a regular stove or a camp stove. No coating means no chemical exposure. This pot isn’t cheap, but you get what you pay for. There aren’t many points of complaint. You have to get used to the pseudo-non-stick of the titanium, but it works well when used right. This is a great option for any chef, whether in the kitchen at home or on the trail. It’s perfect for those who want a chemical-free option for boiling things or making soups. Some metal cookware is questionable in its safety. Titanium is not. It’s essentially non-toxic to humans. In fact, it’s used in bone replacement surgeries and dental applications, and even sunscreen. It is considered biocompatible, so scientists have always thought that this inert metal is no cause for health concern. Now, it’s important to know that titanium buildup in the body is not safe. Studies are now showing that titanium implants, which are largely accepted by the body, can corrode after years of grinding and emit titanium into the body, where it is thought to collect in lymph nodes, the lungs, and the brain. Also, some people confuse pure titanium with titanium compounds. One example is titanium dioxide, a commonly used food additive. This substance can become toxic to the body when too many nanoparticles are consumed. It’s a possible carcinogen with negative effects on the brain. When using titanium cookware properly, there’s no way to ingest this metal or it’s compounds. Since titanium is very difficult to dent, scratch, or otherwise damage, your metal exposure risk is almost zero when using high-quality and pure titanium cookware. 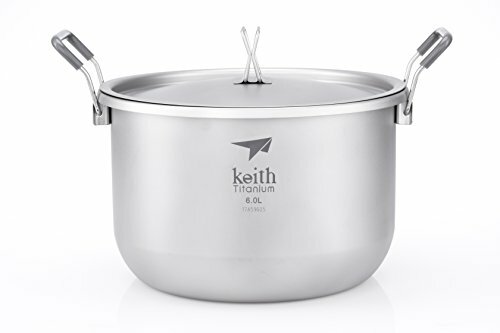 All titanium cookware is useful, but I’d prefer two products: the 10” HUFTGOLD Tri-Ply Titanium Fry Pan and the Keith Titanium 6L Pot. They’re the only two products that don’t have a chemical coating. Between the large skillet and the pot, you can make a variety of meals. The lifetime warranties on both pieces tell me that they are well made. Since titanium products are expensive to begin with, it may be worth it to pay a little more and get pure titanium, instead of a non-stick and titanium mix.